Clockwork wound from the back, open the lid & the princess figure revolves as music plays. This gorgeous bright pink ballerina jewellery box has ring holders, compartments & a pull out drawer. 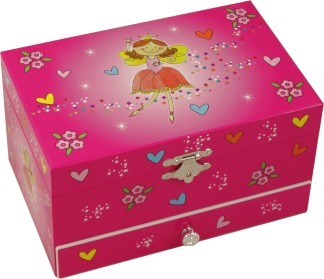 Sophie is a perfect girls jewellery box finished in bubblegum pink with starry design. Open the jewellery box to watch the princess figurine revolve to the beautiful music.